In November, VIVA Gallery in Viroqua welcomes Ray Bock as guest artist. 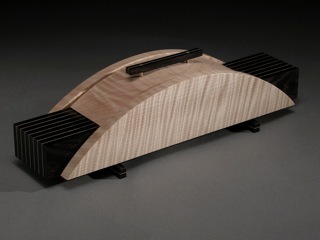 Ray is a talented woodworker whose furniture and sculptural wood accessories are notable for their fluid lines and fine craftsmanship. His work will be featured as a part of VIVA’s “Perfect Table” theme, which will highlight pottery and handwovens by member artists as well. 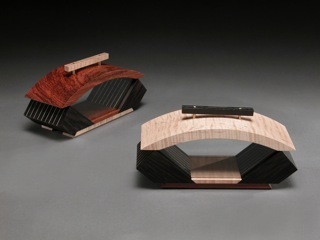 Ray, who lives and works in Viroqua, has had his work featured at some of the nation’s most prominent arts and crafts events, including American Craft Council shows, Milwaukee’s Lakefront Festival of the Arts, the Des Moines Arts Festival, and the Cherry Creek Arts Festival near Denver. Ray studied design and photography at the Illinois Institute of Technology in Chicago, graduating in 1981 with a BA in Design. He went to work for noted architectural photographer Hedrich Blessing, and went on to manage a department of a commercial printing lab. All during this time, furniture making was a serious hobby. 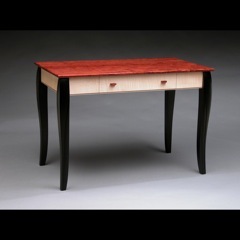 In 1991, when the advance of digital imaging began to take a toll on the printing industry, Ray and his wife left their jobs in Chicago, bought an old farm outside of Viroqua, and Ray began making furniture as his primary means of making a living. Until 2008, Ray sold his work through prominent shows and galleries in North Carolina, Maryland, Illinois, Pennsylvania and Wisconsin. Since that time, he has concentrated on commissioned work and on making sculptural vessels and beautifully-­‐designed wooden boxes. Meet Ray and view his work at VIVA’s First Thursday reception on November 3 from 5:00pm to 7:00pm. The gallery is located at 217 South Main Street in Viroqua. For more information about this and future First Thursday events, contact the gallery at 608-­‐637-­‐6918 or info@vivagallery.net. 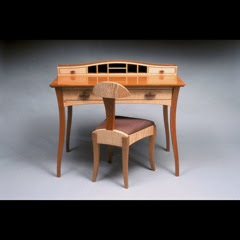 You may see Ray’s furniture and accessories at the gallery throughout the month of November, as well as the work of 16 member artists.